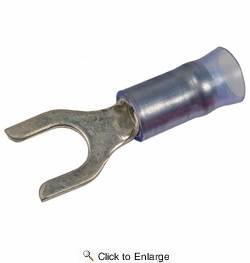 The forked tongue permits convenient assembly and disassembly without complete removal of the connection screw. BUTTED SEAM WITH NYLON INSULATION AND BRASS SUPPORT SLEEVE Electro-tin plated copper terminal with a brass support sleeve. Ideal for cold weather and vibration resistance. Crimp on barrel of terminal and over brass sleeve.